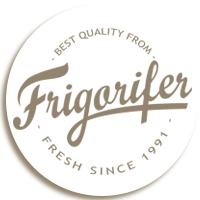 Unlike many fresh vegetables that ripen on the way to the store, at Frigorifer the vegetables ripen naturally in the field until they are picked at their peak. This harvesting technic prevents the usage of artificial colors and flavors. The main objective is quality. Eventually, nothing is better than vegetables gathered right from the field; preserving their taste, texture, color, and nutrition values. The longer vegetables take to reach the freezer, the more nutrients they will lose, due to light, heat and time counter effect.